Fleck sensor networks are being deployed in the Huon and Derwent estuaries and the D'Entrecasteaux Channel to provide up-to-the-minute data about the health of these waterways in areas undergoing rapid increases in development, agriculture and water-based industries. The network will measure water quality data such as temperature and salinity, and, in future, water turbidity, the quantity of phytoplankton, and the recognition of pollutants. The Fleck microprocessor requests data from the sensor unit and passes it to a modem (housed in the white tube) which transmits the data through a transducer (the red object). 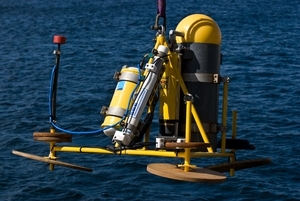 The data is communicated back to CSIRO's Hobart laboratories via underwater accoustic and surface radio links. The CSIRO-developed Fleck technology has the advantages of low power usage, low-cost, reliable communications, robustness, small size and a flexible architecture. Photographer : Nick Pitsas on October 07 2008.